The length of the DG613 has been reduced to make it easier to set up the lasers into tight inverts in the manhole. The DG613 has a grade range from -12% to +40% and is fully self-leveling over the entire grade range. 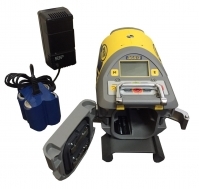 Even the cross axis is fully compensated - providing quick set up and peace of mind that the laser will be level without having to adjust at the bottom of the invert. The DG613 works over a distance of 150m (500ft) providing full operation in a single set-up between manholes. The new RC803 remote control provides full function control and utilizes infra-red light in the pipe for up to 150 meter (500 feet) control. For “over-the-top” setups, the remote utilizes radio communications up to a distance of 130 meter (430 feet). 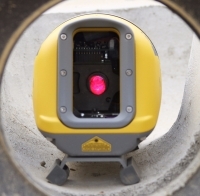 The DG613 has a bright beam that can be easily spotted in the pipe and enhanced with the patented target that bends the beam upwards making it easy to see when looking down at the pipe reducing the need to bend down to see the beam when in the trench or standing above the trench. Multiple attachments are available allowing the DG613 to be mounted in pipes of any size from 150mm (6 inch) upwards. A blower is also available to evenly circulate air through the pipe to avoid refraction of the beam inside the pipe.